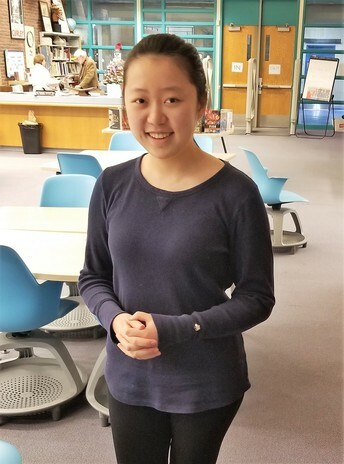 This month, AHS junior Alice Yu received an honorable mention for the 2019 Aspirations in Computing award from the National Center for Women & Information Technology (NCWIT). NCWIT honors four hundred women in high school nationally each year; women in grades 9 through 12 are eligible to receive recognition for their demonstrated interest and achievements in computing, proven leadership ability, academic performance, and plans for post‑secondary education. Alice currently runs the Andover chapter of World Computer Exchange (WCE), a non-profit organization aimed at reducing the digital divide for youth in developing countries. By refurbishing and repairing recycled computers, WCE not only helps to reduce pollution and conserve resources, but also helps youth worldwide by providing them with access to technology. As a freshman in 2017, Alice created the “Computer Fusion Club” at AHS. The club focuses on refurbishing laptops and has about 40 members. In addition to her interest in computing, Alice has a strong interest in math. 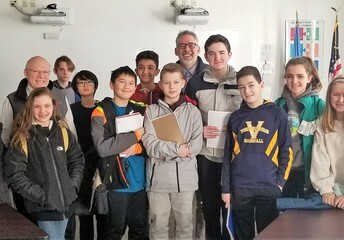 When Alice attended West Middle School, she was a member of the MATHCOUNTS team, and loved the competitive and exciting environment so much she returned to WMS to coach the team for the past three years. Alice is passionate about STEM, and wants to encourage more girls to enter the fields of computer science, artificial intelligence (AI), coding and cybersecurity. She invites anyone at AHS to join the “Computer Fusion Club,” and really enjoys seeing “reborn” computers packed up and ready to ship to youth all over the world. Congratulations on your award Alice, keep up the good work! 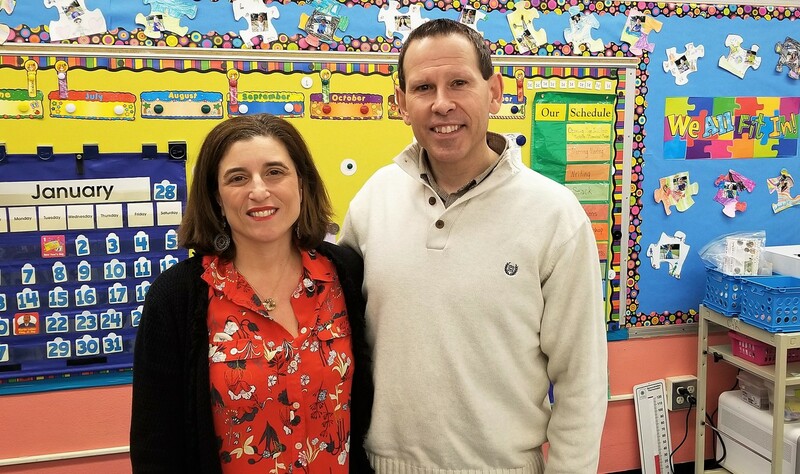 The keys to learning for West Elementary first grade teacher Kevin Cyr and English Language Learning teacher Nicole Hayes are collaboration and inclusion. Kevin and Nicole work together to ensure that all their students have the opportunity to learn about many cultures at West El and to understand that appreciating diversity creates respect for all. Kevin began his teaching career at an Air Force Base in Maine, which drew service members and their families from all over the country. He is proud that the diversity of his students all those years ago is still reflected in his classroom today. Prior to coming to APS, Nicole worked for a global education company focusing on language, academic, cultural exchange, and educational travel programs. Together they seek to provide an inclusive environment that honors the richness of diversity and promotes cultural understanding through their lesson plans and a focus on cultural celebrations. In November, Kevin and Nicole celebrated Diwali with their students at West Elementary. Diwali is a Hindu festival of lights celebrated every autumn in the northern hemisphere. In February, students in Kevin’s class will learn about Chinese New Year. Participation from parents and the community is always encouraged, and for the second year at West El, a parent will guide the lesson plan on the history and importance of Chinese New Year, followed by a student reading a book on how to celebrate the New Year. Kevin and Nicole will finish the lesson with students creating a craft to embrace the “Year of the Pig.” Chinese New Year begins on February 5, 2019 and continues for 15 days. Next week’s Warrior Wednesdays will take a closer look at the history and traditions of the New Year. Last week, I had the opportunity to speak with superintendents around the state at the mid-winter meeting of the Massachusetts Association of School Superintendents (M.A.S.S.). 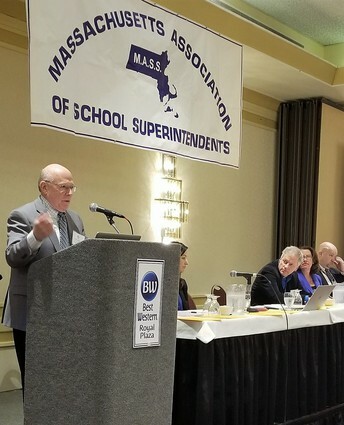 I was honored to be a presenter on a panel on personalized learning with superintendents from Revere and Natick, joined by Department of Elementary and Secondary Education (DESE) Commissioner Jeffrey Riley and the keynote speaker, Andy Calkins, from the Next Generation Education Challenge. The day was focused on “What’s Next” for Massachusetts education and how can we re-imagine education in the 21st century. The three districts, all members of the MAPLE (Massachusetts Personalized Learning Environments) Consortium, share a commitment to exploring personalized learning strategies and learning from each other. While some interpret personalized learning as focusing on individual students moving at their own pace through online curricula, our focus is on personalizing the student experience within the learning community of the classroom. First, we strive to provide students with a personalized environment in which each student is known, valued and included through social emotional learning activities such as morning meetings, Open Circle meetings, and advisories as well as collaborative instructional approaches that build an inclusive sense of community in the classroom and school. Second, we want to personalize access to the curriculum through universal design for learning strategies that provide students with multiple means of engaging with the material, multiple ways that material is presented including written, audio and visual representations, and multiple ways that students can present their understandings. Just like ramps provide universal access to buildings, universally designed learning strategies make the curriculum more accessible and responsive to the variety of ways student learn. Finally, we want to personalize learning itself through such authentic learning experiences as project-based learning, capstone projects, and learning networks. By authentic learning experiences we mean experiences that engage students in the collaborative creation of products or solutions that require extended focus over time, match the real-world tasks and investigations of practicing professionals and integrate knowledge from multiple disciplines. Authentic learning experiences provide students with the opportunity to demonstrate commitment to something meaningful and personal. This commitment can be expressed in legacy documents, TED talks, or products that highlights students’ learning experiences and reflect students’ persistence, leadership and service to others as they move toward their post-high school goals. As a founding member of the MAPLE Consortium, Andover was celebrated as a Catalyst District at last week’s meeting. As part of this consortium, we are one of many districts pursuing innovative ways to better engage students in challenging, meaningful, and fulfilling learning. Our collaboration across districts is enabling us to better implement innovations and share the lessons we’re learning with others. If you’d like to learn more about MAPLE, check out their website. 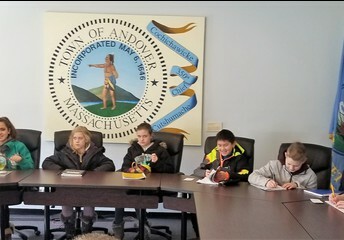 Students from Wood Hill Middle School spent Wednesday morning meeting with members of the Andover community to work on their class project based on the novel Seedfolks. Seedfolks, a short children’s novel written by Paul Fleischman, is a story told by a diverse cast of characters living on Gibb Street in Cleveland, Ohio, each from a different ethnic group. Wood Hill students will learn about the different parts of the Andover community and how we are all connected and rely on each other to be successful. 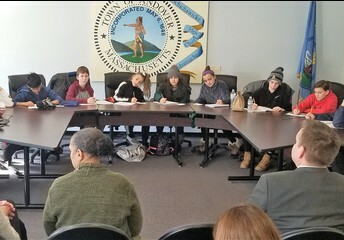 The students spoke with representatives from APS, the Town Manager’s office, public safety, Andover Center for History and Culture, and local business and religious organizations within the town. 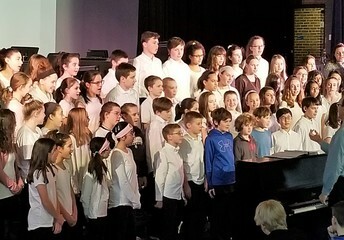 Students from Doherty Middle School performed their Winter Concert on Tuesday. 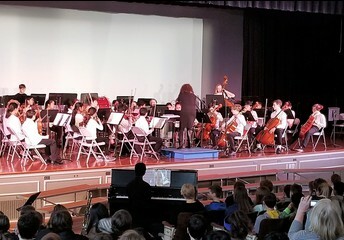 Music and band teachers Julie Diehl and Catherine Hofius led the orchestra and band performance. AHS Chorus teacher Chris Desjardins made a special appearance at Doherty to direct the chorus. Shawsheen is also accepting appointments for screenings and tours on either Friday, March 22, 2019 or Friday, May 10, 2019 for September 2019 enrollment in the half or full day programs. For additional information about the program and tuition rates, please refer to our website or call the school office at 978-247-8200. We ask parents to wait until a screening before filling out the registration forms. Andover Public Schools is reaching out to those in need and affected by the recent government shutdown. Although the shutdown has now ended, we want to continue our support to families during this uncertain and difficult time. Please contact your child’s principal directly for additional information, resources or support with school meals. Additionally, Neighbors in Need (NIN) can provide resources to help those in our community who may be furloughed, or stretching their budget to make ends meet. Anyone in need of food is welcome at one of Neighbors in Need public food pantries. This includes the Andover Food Pantry which takes place on Thursdays from 4-5 p.m. at the Andover Senior Center. Those in need of diapers or formula are welcome to visit the Lawrence location at 60 Island Street, Suite 214-East on Monday – Friday from 9 a.m. until 1:00 p.m. Also, Neighbors in Need accepts contributions and appreciates all monetary, food, diaper, and formula donations. For more details and a complete list of all Neighbors in Need Food Pantries, please visit their website: www.needfood.org All are welcome! 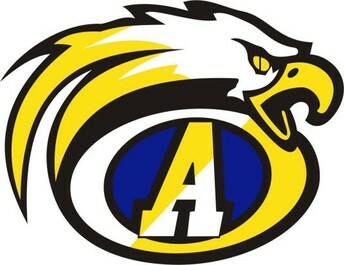 The School Committee is continuing its practice of holding informal forums with Andover families and the community. The next forum will be held on Wednesday, February 13, 2019 from 9 a.m. - 10:30 a.m.
As with previous informal forums, there is no set agenda and we welcome comments on any topics related to our schools. The community is welcome to join at any time during the forum, on the top floor of Memorial Hall Library. Monday, March 11th at 7 p.m.
On Friday, February 15th, the Andover Police and Fire Departments are hosting a “Give Pints for Half Pints” blood drive for Boston Children’s Hospital at the Andover Public Safety Center from 1 p.m. to 6 p.m. Click here to make an appointment or here should you have questions. On Friday, February 1, 2019, come learn the basics of Mambo, Salsa and Cha-cha dancing! Start the evening with lessons provided by First Dance Studio and Royal Palace Dance Studio at 6 p.m. and social dancing begins at 7 p.m. at Old Town Hall on Main Street. No partner? No problem! We hope to see you there.